The dedication in Ann Miller’s new book, “Hatch Guide for Upper Midwest Streams,” is not unusual in its expressed gratitude to her husband, Ken Ankli, and their three daughters: Aura, Abbey and Aiden. Authors often thank those close to them for putting up with their shenanigans during the time it took to write the book. What’s unusual, though, is Miller thanking them “for lovingly putting up with escaped bugs in the house.” That, and her expressed appreciation for them coping with her 3½-year obsession, which led to constructing small, running streams in the garage so she could observe and photograph the life stages of the insects she was writing about. “My project started off largely in the garage, but I had a photo studio in the house, and the darn things kept flying away,” said Miller, an aquatic biologist by training and an avid fly angler. “I had them in a sealed-up room, but when a size-18 sulphur (a tiny, yellow fly) gets away, they are pretty hard to find. 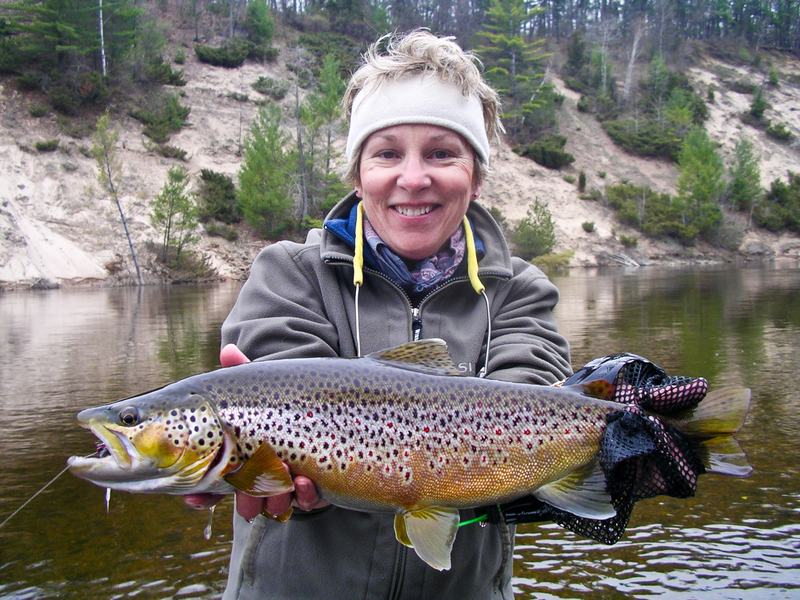 Miller, of Stevensville, is the president of the Fly Girls of Michigan Inc., a Federation of Fly Fishers chapter dedicated to introducing women to the pleasures of fly fishing. She began fly fishing 25 years ago. It’s common to find her on a stream somewhere, fly rod in hand, challenged to solve the puzzle of what big trout or steelhead are eating. Miller hopes her book will help others solve the puzzle, too. “If you can solve the puzzle, you can catch more fish,” Miller said. “People assume that all the bugs are in all rivers. They are not, just as there are not grouse or ducks in every woods or marsh. Miller said her research blew away a widely held belief that gray drakes, the big flies that emerge between May and July, live in gravelly, fast water. Miller’s book, published by Frank Amato Publications in Portland, Ore., is a handy and well-crafted piece, small enough to fit in a boat bag, but rich in detailed information and loaded with 120 terrific color close-ups of the flies typically eaten by upper Midwest trout and the artificial flies that imitate them. Miller’s prose is terse and informative. She explains where each insect lives, how it behaves and when and how to fish the corresponding fly. Fly tiers will appreciate the tying recipes she provides, while anglers should be aided by a handy emergence chart in the back that suggests when to look for the bug. “Insects are the heart of fly fishing,” Miller said. “I know there are people who throw streamers (flies that imitate small fish) and you can catch really big trout that way. We know that brown trout cruise and eat smaller trout at night, but that doesn’t mean they don’t eat big mayflies. They do — along with crayfish and mice. “But if you look at the history of fly fishing going back to England, that was a time when you could only fish with dry flies and fish only upstream. Fishing a fish underwater was considered bait. 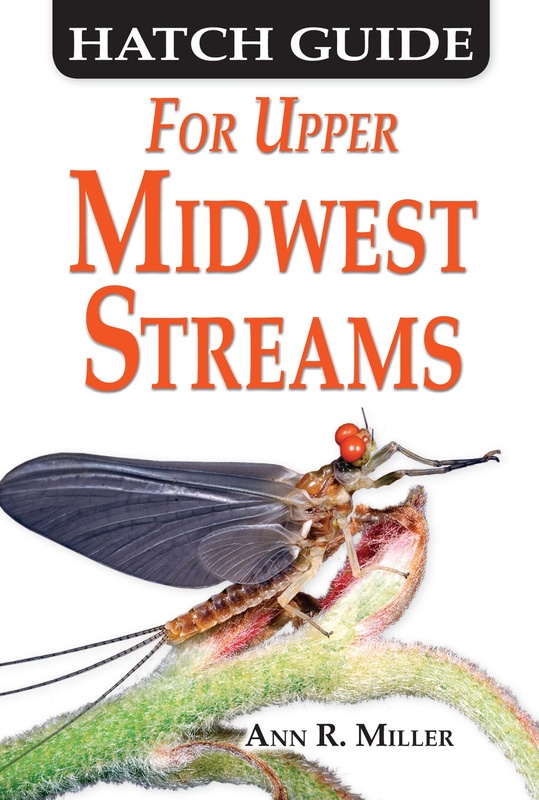 Look for Miller’s book at local Midwest fly shops, on Amazon.com or write her at annrmiller@aol.com. To find Miller, check the nearest trout steam with a hatch. This entry was posted in Uncategorized and tagged Ann Miller, Artificial Fly, Field Guide, Fly Fishing, Fly Hatches, Trout. Bookmark the permalink.